I have learned so far very well that every sailing trip is unique and is always unpredictable. So it happened this summer when I took the command over Athena 38, a charter catamaran in Croatia. I did not get the information on the customers from the agency that hired me (as usual) but I found out that five of them are expected on board. I looked forward to one cabin in advance because sleeping in the saloon of this yacht isn’t very pleasant. The sofa around saloon table is the only place skipper could spend the night if the other places are taken, but the problem is in the shape – the sofa is crescent-shaped. It is possible to sleep well in this ‘bed’ only if your body is ‘banana-shaped’. Nevertheless, I kept hoping that one of the cabins would be my lodge for that week. Unfortunately, when customers finally arrived I found out that the group consists of one guy and four girls, knowing each other from a foreign country they all work in. The first demand was that everybody sleeps in a separate cabin. My dreams about decent bed vanished in an eye-blink. Then we had to make a compromise because there are only four cabins on Athena 38 so two girls decided to share one. My prayers were then directed towards weather forecast because the idea of sleeping outdoors, on the net between hulls seemed more than realistic. Next thing the guy asked me for was to make extremely long tour because they wouldn’t like to miss any of Adriatic wonders…Fortunately, I am used to such demands because people are not aware of distances and relations at sea and I already know how to cope with it. Next demand worried me a little; since they work in a country where pork and alcohol are not allowed they are keen to enjoy it as much as possible during the sailing trip. “Oh Lord”, I thought to myself, “another bunch of drunken ‘mates’ I have to look after…” Alcohol consumption is not so unusual onboard, but in Central Dalmatia (where we are about to sail) pork is usually served only as dried ham locally called pršut. Pork meals are more common in the continental part of Croatia, so I was in trouble if I wanted to please them. Furthermore, they demanded to have both their lunch and dinner at the restaurant. That also would not be a problem because I know many good restaurants along Croatian coast and islands, but if we sailed from restaurant to restaurant a half of places they wished to visit couldn’t be reached. Instead of explaining all that I just responded “No problem!”, hoping for the mercy of gods of sailing. After taking off my customers were so busy preparing Bloody Marys so they forgot about the dinner for the first night. I was also blessed by bright nights so my bed in the net at the bow wasn’t so bad. Next days I talked a lot about fresh fish, seafood and traditional cuisine that my customers forgot about pork. Furthermore, I convinced them that a rich breakfast would be enough until the dinner. 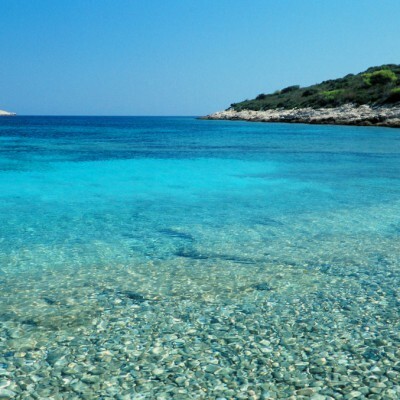 I also convinced them that it is better to spend time swimming in crystal-clear turquoise Adriatic waters than to waste time running to the next restaurant. So my problem with lunch at the restaurant was solved by serving some snacks, fruit or vegetable salad, local cheese or a refreshing soup during a swim break. After few ‘smooth’ days they remembered about pork and asked me to take them for lunch at a good restaurant! Disaster! That was a penalty because I relaxed too much. I knew it! “No problem!” I responded as usual. At that moment I was sailing from Vis to Komiža taking the W route. When I was passing by the island Budikovac I decided to drop the anchor and try my luck at small improvised hut above the beach. I remember that some fellow skippers told me about this place and their questionable hospitality. I acted like I knew very well where I am going and, full of self-confidence asked for a table. ‘Cheerful’ owner told me, in his grumpy manner, that I have to wait for food because his establishment isn’t McDonald’s or similar fast-food bar… I accepted his ‘welcome’ with a smile and asked his lady to show me the table available. And imagine what! She told me that I had to wait for at least an hour or hour and a half if I wanted fish or seafood, but I can get roasted pork with potatoes in a few minutes, directly from the oven! This time the smile on my face was more than honest! I don’t have to mention that I was celebrated as the wizard of sailing trips by my customers who claimed that they just had the best pork roast ever! After the lunch, the talk somehow went to the subject of security and terrorism, as they work in a country where that is a big issue. So they asked me about security in Croatia, especially at sea. I responded in my usual manner “This particular island we stay at the moment is the safest place in all of Croatia…” And I didn’t lie! The guy who was impatiently waiting for his seafood at the table next to us was Croatian Defense Minister himself!